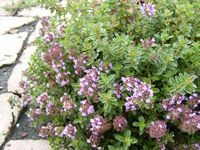 Hardy evergreen perennial that forms a low, mounding bush of dark green leaves and clusters of soft lavender-mauve flowers in summer. Well-drained soil and full sun. Clip plants lightly immediately after blooming, to maintain a compact habit. Grow over a wall feature or along the edge of a flower border. Has an excellent flavor, one of the best selections for cooking. Use the same way as upright thymes. Use in meat, poultry, fish, butter, stews, casseroles, egg, roasted vegetables, cheese, mayonnaise, soups and teas. Fresh thyme is delicious sprinkled on salads. Use in cake, pastry and other sweet dishes. Make lovely dressings or marinades. Take against gastrointestinal disturbances and for the treatment of coughs, colds, bronchitis and inflammation of the upper respiratory tract. Gargle for sore throat and mucosal inflammation.